Powers/Abilities: Immune to fire, able to generate heat and flames, able to fly. History: (Human Torch #2-31, Marvel Mystery Comics #19-88, Young Allies #1-20, ga) Orphaned when his parents died in a train wreck (revealed during the Silver Age to have been caused by the villainous Asbestos Lady), Thomas Raymond was adopted into Pop's Travelling Circus. 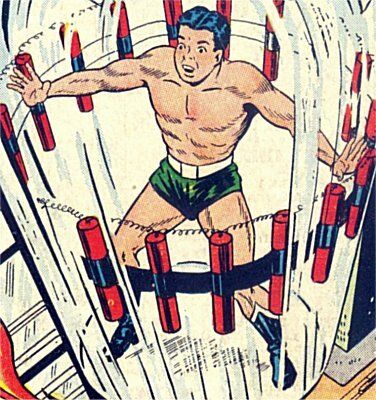 Since he appeared immune to heat, he trained as a fire-eater using the name Toro, until the day came when the heroic Human Torch was passing, and witnessed his act. The Torch was intrigued, and approached Toro to ask him about his abilities. The heat from his own body caused Toro's powers to activate for the first time, and he too burst into flame. The Torch took Toro on as his sidekick. Toro adventured both with his partner, and alongside other teenage crimefighters as part of the Young Allies. (Invaders I #1-41, Marvels #1) Toro fought the Nazis both as part of the Invaders and the Kid Commandoes. (All Winners Comics #1, ga) No synopsis available. (What If? I #4) In 1945 the Invaders were shocked to learn of the apparent deaths of Bucky and Captain America, blown up over the English Channel. Around this same time, Toro accompanied the Torch in attacking Berlin itself, where they invaded Hitler's bunker. Toro was one of the few people to witness the death of the leader of the Fourth Reich, burned to death by his android partner. (Captain America Annual #6) At the end of the war, the Invaders travelled to Japan to destroy and solar-powered prototype tank. (What If? I #4) Toro was present when the android Adam II attempted to assassinate a young and up-coming politician, a fight in which one Captain America lost his life (the Spirit of '76), and another took up the mantle (the Patriot). (Human Torch Comics #36, fb, ga) Toro took a break from adventuring to look after his sick foster mother (meantime the Torch gained a new sidekick, Sun Girl). He returned to the Torch's side eventually, only for the two of them to be ambushed by criminals who used a chemical supplied by the Soviets to depower them. The Torch appeared to die, and the crooks buried him in the Nevada Desert. Toro was handed over to the communists in return for their help. 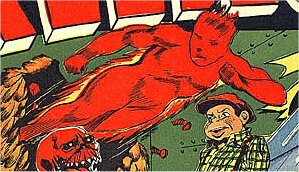 (Human Torch Comics #36-38, ga) When the Human Torch awoke again in 1953 he tracked down Toro, rescued his brainwashed partner, and together the two returned to adventuring. (Saga of the Original Human Torch #4, Avengers I #134, Sub-Mariner I #14) Only a couple of years later, the Torch's powers went out of control, and he appeared to kill himself rather than become a threat to the world. Toro retired, married and settled down. Years later he heard that the Torch had briefly returned, only to die again. Toro attended his funeral, but was kidnapped by the Mad Thinker as he left, brainwashed, and sent into battle against the Sub-Mariner. Freed from the Thinker's control, Toro led his old ally to the criminal, but died trying to capture him.